Many small companies promise to build ultra-quick supercars designed for the world’s richest customers, but very few of them manage to break into the mainstream and fight head-to-head against the likes of Ferrari and Porsche. McLaren took the automotive industry by surprise when it did just that, seemingly coming out of the Formula 1 pits with what has gone down in history as one of the world’s best sports cars. McLaren explains the F1 was born when chairman Ron Dennis, wealthy shareholder Mansour Ojjeh, technical director Gordon Murray and head of marketing Creighton Brown were waiting for a delayed flight at the Milan airport in 1988. The men were talking about how to capitalize on McLaren’s vast racing expertise when one of them brought up the idea of building a street-legal supercar. 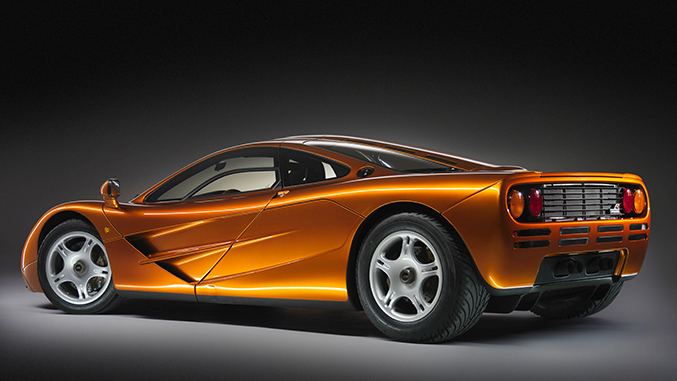 McLaren Cars was formed in 1989, and the team held a ten-hour design meeting a year later to set the groundwork for the upcoming car. The project guidelines were simple but strict: In addition to being the fastest and best-handling car on the planet, McLaren’s coupe had to boast the highest power-to-weight ratio of any production car on sale at the time, it had to weigh no more than 2,464 pounds yet it had to be practical and comfortable enough to use daily. “To my thinking, the ideal car is one in which I could get in the driver's seat and be out for a drive in downtown London, and then want to continue straight on to southern France. A car that you can trust, with functional air conditioning, and one that retains daily drivability. No offset pedals allowed. No high dashboards restricting your view either. Having a low roof hitting your head every time you go over a bump in the name of aerodynamics and styling is out of the question. It is essential that a supercar be a pleasure to drive, and anything detracting from that must be excised,” explained Murray. With these guidelines in mind, a team of engineers started working on what would become McLaren’s first-ever street car. The team quickly decided to build the F1 out of carbon fiber, a material that McLaren had already toyed around with in the early 1980s when it built the MP4/1 Formula One racer. 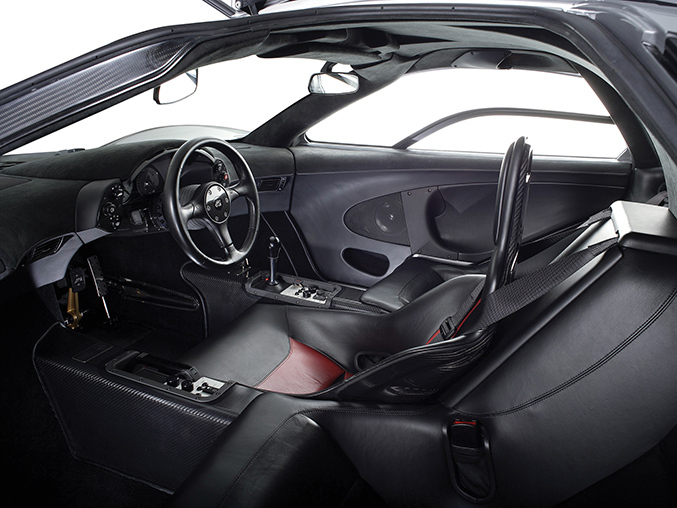 Although the properties of carbon fiber were well known in the automotive industry, McLaren was the first automaker to develop a carbon fiber monocoque for a street-legal car. 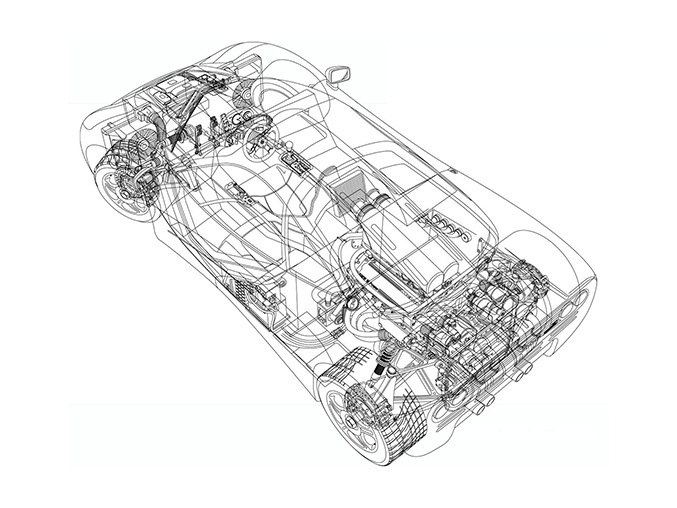 The F1 was designed by Peter Stevens, the same man who penned the Lotus Elan (M100), and McLaren proudly pointed out that it was drawn entirely by hand without any input from computers. Stevens literally started from a clean sheet of paper because McLaren had no design language he could draw inspiration from. British magazine CAR reports that Dennis had so much faith in Stevens’ work that he didn’t want to see the F1’s design until it was completely finished. Inside, the F1 offered space for up to three passengers in a triangular 1+2 configuration that put the driver front and center. In addition to noticeably improving visibility, the innovative setup allowed McLaren to sell the F1 all around the world without making major modifications for right- and left-hand drive markets. The rest of the cockpit was simple and function-oriented; McLaren’s logic was that if a F1 was found in a barn 60 years later it should be relatively easy to restore. A host of switches were found on the center console and on either side of the steering wheel, and the instrument cluster consisted of easy-to-read stainless steel analog gauges with hand-painted numbers. A/C and a purpose-designed Kenwood CD player both came standard, while a F1-specific luggage set helped maximize the use of space. An outspoken fan of the Honda / Acura NSX, Murray tried to convince Honda’s top brass to design a 4.5-liter V10 or V12 engine that he could use in McLaren’s upcoming supercar but the company repeatedly turned down his request. Ultimately, McLaren teamed up with BMW and the F1 was powered by a BMW-designed 6,064cc V12 engine that produced 627 horsepower at 7,400 rpms and 480 lb-ft. of torque at 5,600 rpms in its initial state of tune. The engine bay was famously lined with about 65 feet of heat-reflecting gold foil. Linked to a six-speed manual transmission, the V12 engine sent the 2,513-pound F1 from zero to 60 mph in 3.2 seconds, from zero to 124 mph in just 9.4 seconds and on to a top speed of 240 mph with the rev limiter turned off. The latter figure earned the F1 the honor of being the world’s fastest production car in 1998, a title it held on to until the Bugatti Veyron hit 253 mph. To date, the F1 still remains the fastest naturally-aspirated production car ever built. McLaren built the F1 in a relatively small factory in Woking, England, where it took workers over three months to meticulously assemble each car. Production ended in 1998 after the factory had churned out 106 examples (including 64 street cars). McLaren went on to help Mercedes-Benz develop and build the SLR, and later developed its own MP4-12C, but the company didn’t launch a true successor to the F1 until it introduced the gasoline-electric P1 supercar at the 2013 edition of the Geneva Motor Show. Although the F1 was designed exclusively as a road car, race teams asked McLaren to build a track-only model that could compete in the world’s toughest endurance events. McLaren was reluctant at first but it eventually caved in to popular demand. Period reports indicate the modifications made to the F1 were minor and largely limited to aerodynamic add-ons, a tweaked suspension, an engine de-tuned to 600 horsepower and a stripped interior. 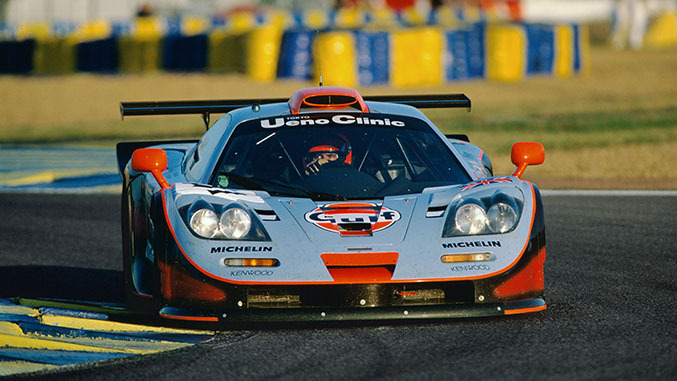 The F1 GTR took first place overall in the 1995 edition of the 24 Hours of Le Mans, beating well-established competitors in the GT1 class like the Nissan Skyline GT-R LM, the Toyota Supra LM, the Ferrari F40 LM and the Porsche 993.